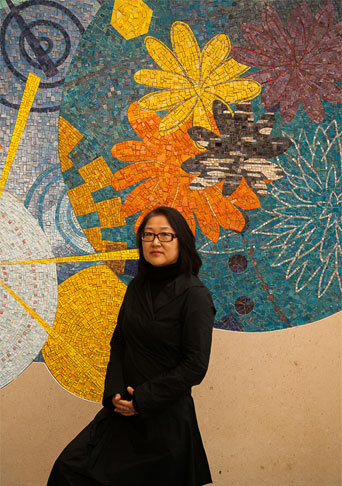 Daru studied at Seoul National University, receiving her Bachelors degree in 1977. Daru moved to New York that same year to study at the Pratt Institute and received her Masters degree in 1980. Since then, Daru has been widely exhibited in the United States and Korea, including the Bronx Museum of the Arts in New York, Hallwalls Contemporary Arts in Buffalo, the Phillips Museum of Art in Pennsylvania, and the BenShahn Galleries in New Jersey. Recently Daru has shown at 2x13 gallery, Allen Sheppard gallery, Amy Simon fine art and Metaphor Contemporary Art, Kumho Museum. gallery BK, galerie Captlain-Matignon. Daru's exhibitions have been reviewed in numerous publications including, the New York Times, Art in America, Art Asia Pacific, Asia Times,Art in Culture, Wolgan Misool, Arts Gazette, Space Magazine, New York Sun, Buffalo News, Golf Herald, Business Week and numerous local newspapers, radio and television. Daru is the winner of MTA Arts for Transit - Jamaica Line(Crescent Street Station). This project was completed in May 2007, and is a permanent installation. In 2011, Daru completed three monumental public art works in Korea for the LIG Insurance company. Daru is represented by gallery BK in Seoul, Galerie Caplain-Matignon in Paris, Amy Simon Fine Arts in Connecticut.